Having gone through one batter from Wasatch and Squatters already, I didn’t know if we would have a perfect inning or not… well, thank god they came through with their 4th beer of the trip. We finally were able to step out of the alcohol content restrictions and enjoy a beer that they really only get to sell at the liquor stores. Wasatch Beers The Devastator Double Bock delivered and then some with a hearty full flavored beer with a good head, clean bitter hop taste that stays on the tongue (not down the throat), and solid ABV. While some thought this was a bit tart, I tend to think it was just right and perfect for the category. 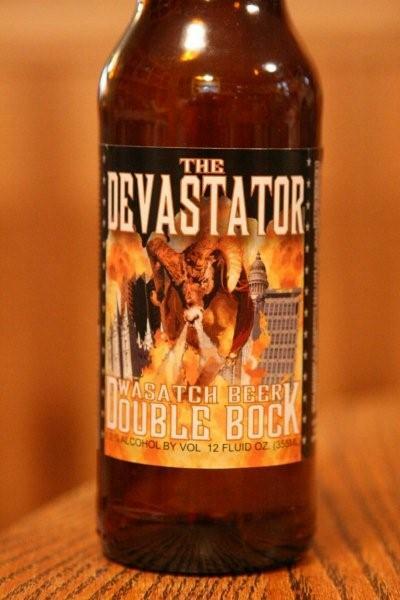 This entry was posted in Double Bock, Wasatch and tagged Double Bock, Squatters, The Devastator, Utah, Wasatch Beers, Wasatch Beers The Devastator Double Bock, Will Buy Again. Bookmark the permalink. I also really enjoyed this beer. Unfortunately as of October 2008 they appear to have cut back or eliminated the chocolate malt which added a flavor and sweetness that is now lacking and which I felt made this distinctive from other products out there and why I liked it so much. Now I won’t buy it again. Well there’s always Squatters Hops Rising. Had a few “Devastator” brews this past week and it is a GREAT beer!! Wish I could find it here in Pennsylvania! !